Visitors can enjoy bird watching, nature study and canoeing. The park is valuable for public access and enjoyment of the river frontage, since much of the river frontage between Chase and Kamloops is in private ownership. It encompasses a 5km section of riparian habitat on the South Thompson River. Surrounding vegetation consists of aspen, cottonwood, Ponderosa pine, Douglas fir, willow, Russian olive, Hawthorne, Saskatoon berry, grass and sedge. The park provides important habitat for trumpeter swans and a variety of other waterfowl. Shorebirds, passerines, beavers, muskrats and otters also frequent the area. The South Thompson River contains trout, salmon and other fish species. Stay Safe: Bring your own drinking water as potable water is not available in the park. Pritchard park is located on the South Thompson River, approximately 40 km northeast of Kamloops. The park is best accessed by boat. History: The park was created as a result of recommendations made in the Kamloops Land and Resources Management Plan. Cultural Heritage The presence of cultural heritage sites is unknown, but there is a possibility of kekuli pits in the area. Conservation: The park protects a 5 km section of riparian habitat and frontage on the South Thompson River. Aspen, cottonwoods, Ponderosa pine, Douglas-fir, willows, Russian olive, hawthornes, Saskatoon berry, grasses and sedges are protected within the park. Wildlife: The park provides habitat for Trumpeter and Tundra swans, a large variety of other waterfowl and shorebird species, passerine bird species, beaver, muskrat, and otter. Trout, salmon and other fish species inhabit the South Thompson River. 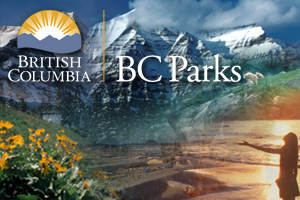 Approved Pritchard Provincial Park Management Direction Statement [PDF] is available online in pdf format. Canoeing on the Thompson River is popular with visitors. There are wildlife viewing opportunities in the park.The park provides important habitat for trumpeter swans and a variety of other waterfowl. Shorebirds, passerines, beavers, muskrats and otters also frequent the area.